HM Revenue & Customs (HMRC) has been granted new powers to help combat online VAT fraud conducted on digital marketplaces. Originally outlined by the Chancellor in the 2017 Autumn Budget, the new powers – known by the term ‘joint-and-several liability’ (JSL) for online marketplaces – strengthen existing arrangements to make online marketplaces accountable for VAT fraud committed by online sellers on their platforms. In its announcement, HMRC said: “Online marketplaces can help those who sell through their platforms to understand the tax rules and therefore avoid fines from HM Revenue & Customs (HMRC). “And, indeed, they have the responsibility to make sure that fraud does not happen on their watch. Under the JSL powers, sellers based either in the UK or overseas who are not paying the correct VAT when completing sales in the UK must be removed by the marketplace once HMRC issues a notice to them. If marketplaces do not remove the seller then HMRC will pursue the site for any future unpaid tax by those sellers. 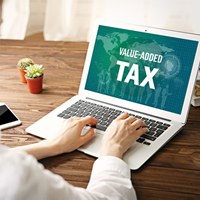 The new rules, which came into force in March, also make marketplaces liable for VAT where they knew, or should have known, that an overseas online seller should have been VAT-registered but was not. In order to help enforce the rules, marketplaces must now also make sure sellers using their platforms display a valid VAT number on the site if they possess one. Businesses operating in this sector are also being encouraged to register for the Fulfilment House Due Diligence Scheme, which began on 1 April 2018. This scheme requires businesses that store imported goods for or on behalf of overseas sellers from outside the EU to keep records and perform checks on the goods they are storing. It has been estimated that these measures will help to protect around £1 billion of tax revenue by 2023.